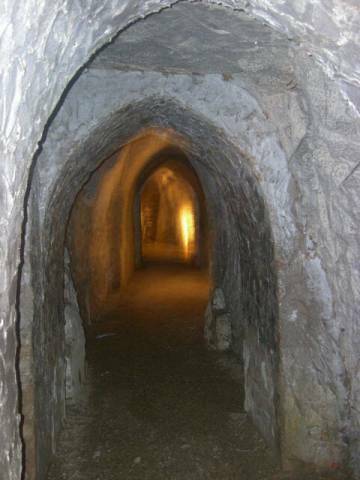 Are the Hellfire Caves in Buckinghamshire haunted? 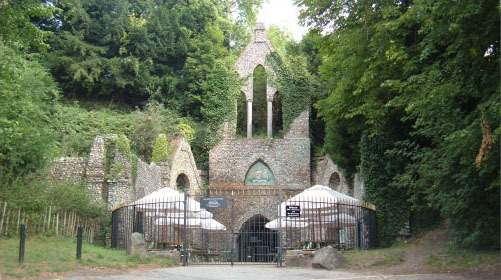 West Wycombe Caves, also known as Hellfire Caves, located in the Chiltern Hills, Buckinghamshire, England, are most well known as a meeting place for members of The Hellfire Club. The caves were extended by Sir Francis Dashwood (later Lord le Despencer) between 1748–1752. The clubs were rumoured to be the meeting places of "persons of quality" who wished to take part in immoral acts, and the members were often very involved in politics. The caves were refurbished and made suitable for visitors during the 1950s by the late Sir Francis Dashwood, 11th Baronet. They're now open as a tourist attraction, with life-sized waxwork figures in period costume illustrating the life of the caves in the 18th century! Doesn't really sound like the kind of place you'd expect to be flushed with paranormal activity, does it? Perhaps the ghostly presence is because of the amount of occult rituals, which took place exactly 300 feet below St. Lawrence's church? Famous poet Paul Whitehead, a friend of Sir Francis Dashwood, gave Dashwood fifty pounds to put his heart in an urn after he died and keep it in the caves. The urn is still at the caves today but the heart was stolen by an Australian soldier around 150 years ago. Paul Whitehead's ghost is seen wandering the caves and the grounds above, perhaps looking for his heart? Or more likely angry because of it's theft!. His figure has been seen dressed in 18th century clothing, and is thought to be the source of the terrifying poltergeist activity. Many people think the picture (below) is him, which was taken by one of the staff who conduct the ghost tours. Good enough evidence to go then?